Do you ever feel like there are not enough hours in the day? What if we could maximize our time and make the most of a routine we engage in daily – showering! Softsoap is inviting you to empower your shower with the NEW Softsoap Luminous Oils Body Washes, a simple way to hydrate and cleanse skin. Now you can achieve soft and radiant skin with a fragrant-rich, luxurious body wash – no extra steps required! These new Softsoap Luminous Oils Body washes have just a touch of luxurious oil, essence of peony or iris and an alluring fragrance that draws you in! It is a non greasy formulat that invigorates your skin and leaves it radiant and soft! Avocado Oil & Iris - Softsoap® brand Luminous Oils body wash, made with real avocado extract oils. This new Softsoap® formula has just a touch of luxurious oil, essence of iris, and an invigorating fragrance. 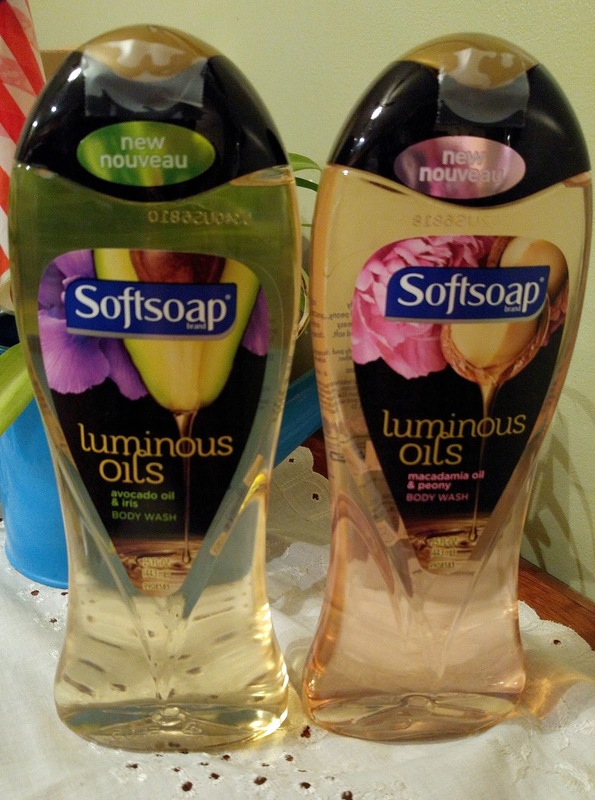 Macadamia Oil & Peony - Wow your senses with new Softsoap® brand Luminous Oils body wash, made with real macadamia extract oils. To celebrate the launch of the new line, Softsoap is challenging you to share how you make the most of your shower. Whether it’s exercising your vocal cords, planning your day’s wardrobe or simplifying your cleansing routine with the new Softsoap Luminous Oils Body Washes, there are endless possibilities to maximize your time. So how do I make the most of my shower? It is my place to relax and have some privacy... sometimes. Some days when I am in the shower, a child may barge in to brush their teeth or use the toilet. I am unsure why, since we have two other vacant bathrooms when I am in mine. Maybe it is to be close to Mom. But when I am not being bothered, I love to feel the warm water beating on my back! The wonderful aromas wafting from Softsoap Body Washes fill the air while I am lathering up and take me to a different place. A place of calmness and peace, no need to worry about getting the kids on the bus, lunches packed, soccer practice, etc. Those few moments of peace and bliss can really impact your day in a good way. So get taken away with Softsoap Luminous Oils Body washes. For more information on Softsoaps head on over here! These new Luminous Oils Body Washes are currently available at mass retail, drug stores, and grocery stores nationwide beginning January 2016. Suggested retail is just $2.97 each for 15 fluid ounces.